Your phone number is one of your most prized possessions. You carry it with you every day, wherever you go, and it is your link to the wider world. However, due to the nature of technology today, our numbers, and the numbers of our loved ones could fall into the hands of people we do not know. People who could use our contact information to cause harm, whether through spam, harassment, or worse. One of the main goals of CallApp is to protect our users from over-the-phone predators. The world can be a scary place with telemarketers, unwanted calls, or unregistered pre-paid phone numbers. Combining our various features, CallApp makes the #1 warrior that protects your mobile self. The very first step in protecting yourself from over-the-phone harassment is knowing who is on the other line. Whether their motivation is personal harassment or selling you a scam, predators take advantage of their ability to call anonymously and hide their number in order to reach you. CallApp provides you with the ultimate Caller ID feature- one with the largest database in the market of over 3 billion numbers. Through our Caller ID feature, you will know the real identity of who is calling you. The ability to identify any number that comes your way extends from phone calls to Caller ID for all your messaging apps like WhatsApp, Viber ad SMS. A tactic used by predators which has gained popularity over the years is termed ‘catfishing’, the term for scammers who take someone else’s identity in an effort to lure in a victim. This can occur on messaging apps, or worse, dating apps like Tinder. Due to increased use of online dating, these scams have gained popularity and these stories often lead to dark endings. With CallApp’s Caller ID, you have the power to confirm the identity behind the number, making sure whoever you are talking to is not a threat. This is a brilliant proactive step we provide our users with in order to prevent any form of harassment from coming their way. While the first step is identifying the harasser, the second step is blocking them out of your life. 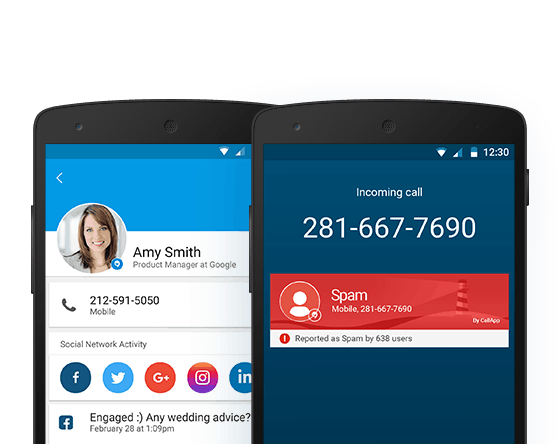 CallApp’s Call Blocker feature provides the ultimate service when it comes to blocking unwanted numbers. Firstly, we provide our users with instant primary protection from fraudulent callers with our feature that allows you to block common spammers. CallApp also allows users to block private and hidden numbers, as well as create a Block List which allows you to add any of your existing contacts to the list of contacts you wish to block immediately. Our advanced Call Blocker setting gives you two options when it comes to dealing with blocked numbers: hang up or silent. If you chose to hang up, the call does not even come your way, yet if you still wish to see when you receive a call from an unknown there is the silent option where the call comes through, but it is silenced. While both our Caller ID and Call Blocker features give you the ability to protect yourself from phone harassment, CallApp goes one step further. We give our users the ability to take action against predators. Our Phone Call Recorder for both incoming and outgoing calls goes beyond primitive recording. We also provide the option of sharing your phone call recordings on various social media platforms. This allows our users the ability to attain evidence of over-the-phone harassment with the touch of a button. Harassment over the phone is a crime and recording phone calls can be used as strong evidence against worldwide predators. With these advanced features, CallApp ensures the ultimate package of protection for our users. We understand the importance of keeping your calling experience smooth and pleasant, and our number one aim is protecting your mobile self from any form of harassment or harm that may come your way.